Nkyinkyim is an evolving art installation/monument (work still in progress) created by award-winning Ghanaian artist Kwame “KABE” Akoto-Bamfo. The concept was created and developed by Kwame Akoto with contributions from Delali Dziedzoave (Architect). The proposed site is at Nuhale-Hwakpo, in the Greater Accra Region of Ghana. The art work /Installation will be made of a wall-like monument which will bear relief sculptures as well as sculptures in- the -round (outdoor theatre) that will tell stories of our Ghanaian/African ancestors. The word “ Nkyinkyim” is both an ‘adinkra’ symbol and a proverb. It directly relates to the travels made by our ancestors and also their journeys from where they migrated from. It also refers to the physical shape of the art installation which is going to be in twists and turns. The story telling on both sides of the wall will be chronological. Also there will be themes for each part of the wall, which will represent a particular stage in the Ghanaian/African historical timeline. The artwork seeks to involve not less than 11, 1111 (Eleven thousand one hundred and one) figure sculptures to tell its story. The Nkyinkyim Installation is being developed with the august partnership and support from the Ghana Museums and Monuments Board. The architects, Delali Abla Dziedzoave and Afua Asantewaa Temeng, of Iconica Ghana Ltd are currently working on the designs of the site studios and visitors reception facility. They are interested in researching and creating eco-friendly sustainable architecture using local materials like adobe, wood and thatch. To help develop and improve on the local architecture, the youth of Nuhale will be engaged in the construction of the structures bringing their indigenous building skills to bear on the project. 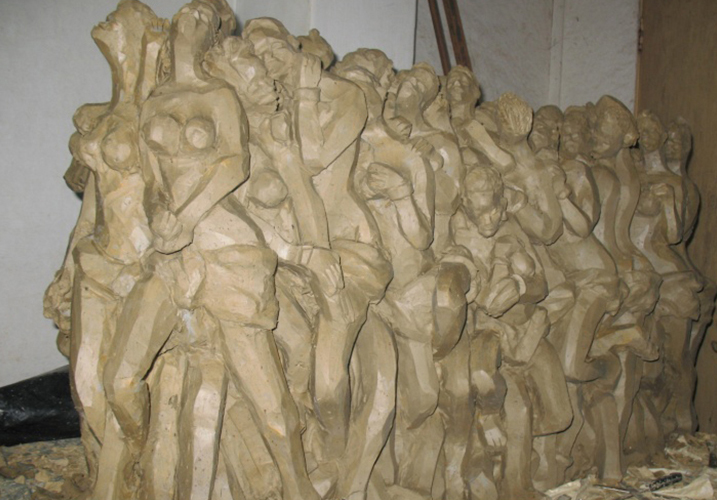 The first 1000 cement heads were created at Osramba’s studio with artists and apprentices from Accra and Nuhale.